Our Food Safety Norovirus Kits contain a complete set of items needed by first responders. A fully equipped spill kit is one of the most important tools for your team members in the event of a contamination event. The kit needs to be available and fully stocked in order for your team members to properly disinfect a contaminated area. Store the kit in an easily accessible area and make sure your first responders are aware of its location and are properly trained. $22.95 includes one, single-use complete clean up kit with 23 items. Contact us if you need more than a few vomit kits. 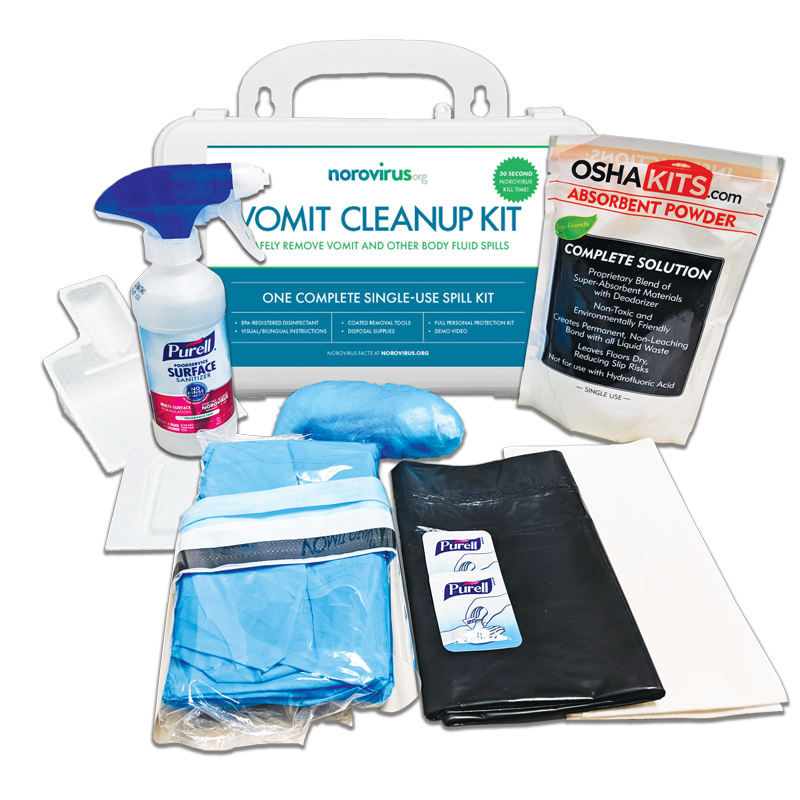 Norovirus Vomit Clean Up Kits are packaged and shipped 16 kits per case. Contact us at info@noroviruskit.com or 1-800-270-0153 to learn more or request a sample. The Norovirus Kit is different from other clean up kits: Our premium kits contain the same absorbent powder used by hospitals for up to 3 liters of fluid absorption, a full 8 oz bottle of PURELL® Foodservice Sanitizer, glossy/water resistant instructions with pictures, a complete set of protective body wear, a sturdy handheld scoop and scraper. a full set of glossy (waterproof) bilingual instructions with images. Includes a full set of written procedures as required by state and local governments. We can partner with your food safety team to customize the composition of the Norovirus kits. We can also brand the kits and/or the instructions for your company. We can include any additional items you require to make the Norovirus Kit fit your needs. Norovirus kits are packaged and shipped 16 kits per case. Copyright Norovirus Kit. All rights reserved.